With increasing demand for Wi-Fi coverage expansion, IT staffs are always worried to configure APs ONE BY ONE in the hundreds’ place. Now, the Handlink ACS utility offers handy functions to control APs from a central computer, and it significantly decreases labor costs when deploying new or extending current Wi-Fi networks. 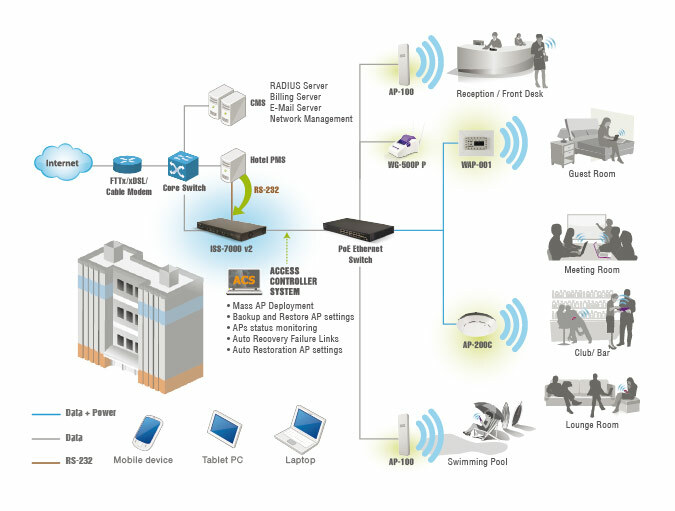 Handlink’s Access Controller System helps Hotel MIS staffs simply and quickly to finish Mass APs configuration. They can scan APs on the networks first, edit AP profiles and then apply the files to selected APs. Configurations for multiple APs can be done in just a few minutes. The MIS staffs can just simply work through ACS online to adding APs, change the settings, remote APs status and deleted APs without going into the guest room. The AP settings are included IP address, ESSID, radio frequency and Channel defined. Handlink ACS also enables firmware upgrade for a batch of APs. ACS can automatically monitor AP’s status 24/7. Even more with Handlink PoE switch integrated, when an AP is detected as offline in the setting time interval, the central system will automatically recover the connection; when MIS staff replaces a new AP, the central system will automatically restore the original setting after the replacement. The Access Controller System will be not only soon to resume the work and all changes will be listed in the log report. It also enables MIS staff to complete multiple APs configuration process as well as future maintenance of standalone APs in easy steps to minimize the time, cost and effort.